The Mara at Disney's Animal Kingdom Lodge serves breakfast from 7:00am until 11:00am and is the resort's only counter-service location. 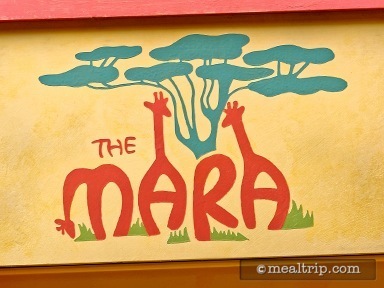 The restaurant itself is very close to the pool area, which is fitting since "the Mara" is an actual river that flows through Kenya and Tanzania. The low ceilings are the first thing most people notice when walking into the dining area, which has some great design cues that, unfortunately tend to get lost in the shadows. The columns in the space are intended to resemble trees and while the ceiling itself is painted blue, a canopy of tree-like elements are hanging from the medium-sized main dining area. The breakfast offerings tend to be more American but with a few African twists tossed in the mix. A good example would be the Bobotie Platter. While some people may not know what Bobotie is, it's basically egg-based, almost like scrambled eggs, but with more form. The Bobotie Platter combines ground meat and seasoning with an egg custard baked on top and is served with pap and chakalaka. Cold cereals, Mickey Shaped Waffles, Oatmeal, and a Fired Egg, Ham, and Cheese Sandwich are available for those guests not wanting a culinary adventure so early in the morning. Assorted muffins, danishes, a cinnamon roll, and whole fruit is also available.